Sleep apnea is one of a number of sleep disorders that poses mild to severe sleep interruptions. It is one of the most well-known of the list of possible sleep disorders for its frequency. 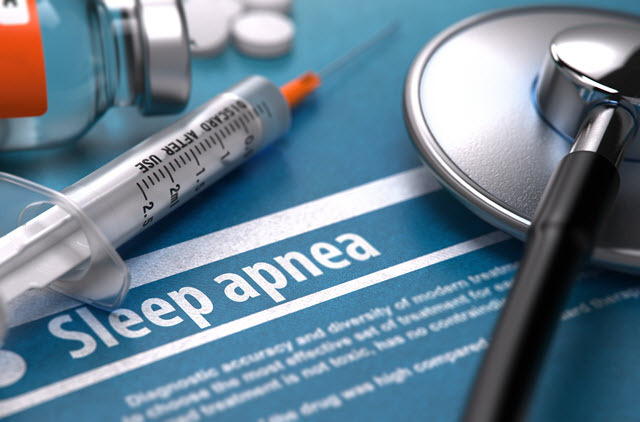 Signs and symptoms of sleep apnea are quite pronounced, but go unrecognized by the person with the disorder for one very key reason: he or she never wakes up while experiencing breathing “events,” or apneas. Unless someone else shares the bed or close quarters the symptoms of the disorder could go undiagnosed and symptoms range from nuisance fatigue to high blood pressure and worse. Obstructive sleep apnea: by far the most common is caused by a collapse of your airway while sleeping. This contributes to the accompanying snoring, but it is most obstructive because it cuts off air during the breathing process, thus called a sleep breathing disorder. Central sleep apnea: think “central nervous system” and you get the idea—your breathing is in fits and starts but not due to obstruction but lack of neurological messaging. Remember, the brain requires a certain level of oxygen to function before brain cells die. When central sleep apnea gets severe those affected risk brain dysfunction and death. Mixed and “complex” sleep apnea: if you experience “mixed” sleep apnea you may experience both obstructive and central sleep apnea. In most cases, though, obstructive sleep apnea was the primary disorder and has worsened to include symptoms of central sleep apnea. The common misconception is that sleep apnea is snoring or being unable to breathe while sleeping. These are simple and incomplete descriptions of a nighttime breathing disorder that generations ago could ultimately cause life-threatening illnesses, including congestive heart failure. And, until the past few decades, treatment was impractical and widely unavailable. Most sleep apnea sufferers may complain of constant fatigue and lack of concentration. Signs of general loss of sleep, including drowsiness and loss of concentration, irritability and mood swings. The challenge with sleep apnea is that for the most part the signs and symptoms are unknown to the sufferer. You could experience obstructive sleep apnea regularly and never wake to know you have the disorder. Loud snoring and gasping for air doesn’t necessarily wake a sleeper. Commonly the disorder is noticed by a partner or someone else living in the same quarters. Given the physical signs of sleep apnea: snoring, choking, pauses in breathing cycle, plus other notable physical characteristics doctors are usually quite proactive in diagnosing this disorder. In some cases patients may be asked to take a sleep test, called a polysomnogram. This instrument, used in sleep medicine, measures an assortment of behaviors and functions during a sleep cycle, including heart rate, brain activity, temperature, facial movement, breathing rate, and eye movement, to name a few.